Life in Siphandone, in southern Laos is shaped by the Mekong River. I first noticed it in the trees, whose roots, planted deeply in the river, have formed to the strong current; flowing downstream as if they too are reaching for the sea. It's also visible in the rocks and islands that give the area its name, which means "4,000 islands." Under the strong flow of the river, seemingly unmalleable rocks have smoothed and become part of the river. Siphandone is a 50-kilometer stretch of the Mekong River. The area is a labyrinth of braided channels and islands and sandbars broken by rocky rapids, seasonally flooded wetlands and Asia's largest complex of waterfalls. You never know what breath-taking waterfall you may find behind each bend in the river. The physical landscape is clearly shaped by the river's flow, but so are the lives of communities that are bound to the river. 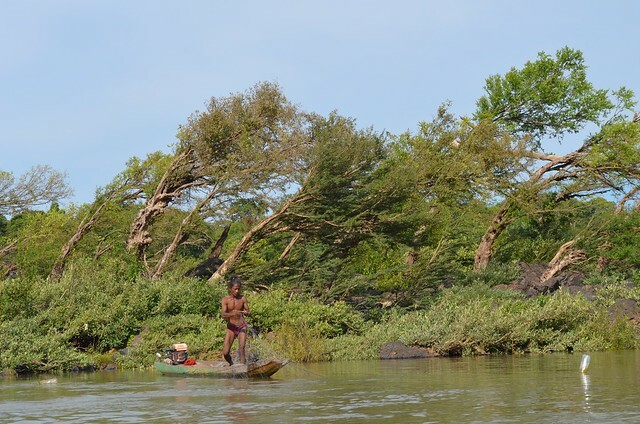 The many channels provide a basis for transportation and access; and a key route for fish migration, which is fundamental for the food security and livelihoods of communities in this area and throughout the Mekong River Basin. The river often dictates daily life. Early in the morning, the river can be seen brimming with activity, as fishermen are checking their traps and boats pull up to the market, at Nakasang heavy with fish to be weighed, valued and sold. Siphandone has been described as a microcosm of the entire lower Mekong River - a “site so rare in nature that every effort should be made to preserve [it],” - in reference to its unique levels of aquatic biodiversity and the vast array of fish species that migrate through the area. So much of what the Mekong River’s rich fisheries and resource provide is encapsulated in the remarkable area of Siphandone. The Mekong River is home to the world’s largest inland fishery and is critical lifeline for Southeast Asia. However, construction of the Don Sahong Dam, the second in a cascade of dams planned and under construction on the lower Mekong River mainstream, threatens to irreversibly alter Siphandone's unique landscape and, consequently, the lives of its people, as well as those up and downstream. These changes are already visible, as cofferdams now block the flow of water through the Hou Sahong Channel. The dam site is just two kilometers from the Cambodian border, and construction activities can clearly be seen from across the river. Though the governments of Thailand, Cambodia and Vietnam expressed strong concerns, along with scientists, civil society and local communities, construction on the Don Sahong Dam officially began in January 2016. When life is so intricately entwined with a river, even the smallest change will have consequences. The Don Sahong Dam's potential impacts are far from small, and would reach far beyond Siphandone, reverberating throughout the Lower Mekong Basin. See more photos of the life and landscape of Siphandone, and read my Op-Ed in The Bangkok Post to learn more about the Don Sahong Dam.